Just a few hours after Judge Steve Thomas allowed students at Kountze ISD to hold signs at football games with religious messages by ordering a restraining order against the school, a student in a different school just a few miles down the road is facing punishment by her school for having a Bible Verse painted on her face at a football game. Shelby Lafour goes to West Hardin ISD. Cindy Lafour, Shelby's mother, has always encouraged her kids to stand up for what they believe. Cindy's daughter Shelby, a West Hardin ISD Cheerleader, took it upon herself to write a verse on her face at the Football game Thursday night. 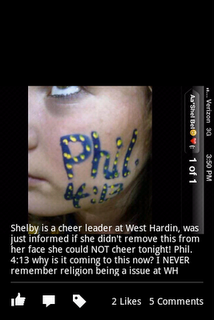 West Hardin ISD did not like the verse on Shelby's face and Cindy says that Shelby's cheer coach told Shelby that she could not have "Phil 4:13" painted on her face. The cheer coach explained that it was not her decision to ban the Bible Verse face paint. The cheer coach said the orders came from the West Hardin ISD Administration/Management.